The Consolidated Model 28, designed by Isaac Laddon, originated from a US Navy requirement of late 1933. 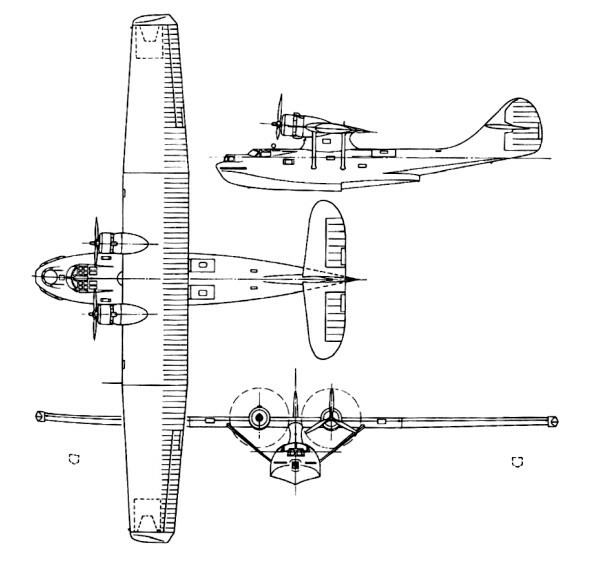 The prototype XP3Y-1, developed from the PY-1/P2Y and flown for the first time on 28 March 1935, introduced the parasol wing constructed on the basis of a cantilever wing requiring no supporting structures, although two small-section struts were mounted between wing and hull on each side. Another new feature was the introduction of stabilising floats which retracted in flight to form the wingtips. Initial trials of the prototype left little doubt that the Navy was about to acquire a significant aircraft. The PBY-1 began to enter squadron service in 1937 and by mid-1938 14 squadrons were operational. The first 22 aircraft built were PBYs and were built in the USA. Also built by Boeing Aircraft of Canada at their Vancouver plant, as the PB2B-1. Fifty-five Boeing Canada-built PBY-5 were eligible for conversion to 28-5ACF status which allows further conversion to air transport category. Production as a pure flying-boat ended with the PBY-4, for the last of these was converted to an amphibian with retractable tricycle-type landing gear, under the designation XPBY-5A. Subsequent aircraft had this as standard. Production of the PBY series would be undertaken by Consolidated in the United States, Canadian Vickers and Boeing of Canada in Canada, the Naval Aircraft Factory in Britain and state factories in the Soviet Union under the Lend-Lease Act. Between 27 and forty Model 28 Catalinas were built in the Soviet Union as the MP-7. Initial export aircraft went to Russia, where the type was built subsequently in large numbers under the designation GST. The RAF acquired a single example for evaluation in 1939 and almost immediately ordered a batch of 50, the first of many to serve with Coastal Command. The name Catalina (adopted first by the RAF) was used later by the USN for the various versions which entered service. The type was also to serve with the RAAF, RCAF, RNZAF and the air arm of the Dutch East Indies. The RNZAF operated 56 Catalinas, both PBY-5 and PB2B-1 models. They were used for maritime reconnaissance and air-sea rescue between 1943 and 1956. The PBYs were withdrawn from service post-war and sold for scrap in 1952; the PB2Bs soldiered on until replaced by Short Sunderlands in 1953-54. 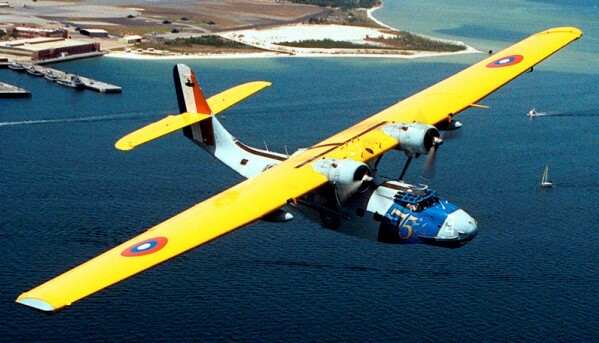 The RCAF chose the PBY-5A as its replacement for the Supermarine Stranraer. During World War II, Boeing Aircraft of Canada, Canadian Vickers and Canadair Ltd. made almost 800 PBY's. 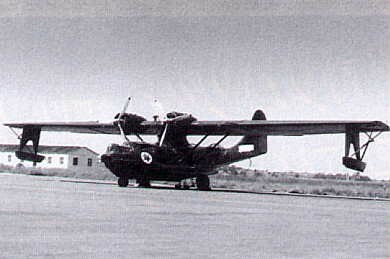 The RCAF called its version the 'Canso A' - A for amphibious. The PBY-5A first flew for the Royal Canadian Air Force on 20 March 1944. A number were operated by the USAAF as OA-10As. The Amtorg KM-2 was an improved PBY Catalina, built under Consolidated license. Engines: 2 x Pratt & Whitney R-1830-92 14-cylinder Twin Wasp radial, 1,200hp, 880kW. Engines: 2 Pratt & Whitney R1830 Twin Wasp, 1200 hp. Length: 63 ft 10.5 in. MAUW: (military): 36,400 lbs (16,51l kg). Range: 2350 sm (3728 km). Engines: 2 Pratt & Whitney R1830 Twin-Wasp, 1200 hp. Length: 65.1 ft (19.83 m). Wing span: 104 ft. (31.7 m). Weight empty: 14,240 lb. (6,465 kg). Max. bomb load: 2,000 lb. (900 kg). Cruise speed: 180 mph (290 kph). Ceiling: 24,000 ft (7,300 m). Range: 4,000 miles (6,400 km).